Detailed analysis of data collected by Rosetta show that comets are the ancient leftovers of early Solar System formation, and not younger fragments resulting from subsequent collisions between other, larger bodies. Understanding how and when objects like Comet 67P/Churyumov-Gerasimenko took shape is of utmost importance in determining how exactly they can be used to interpret the formation and early evolution of our Solar System. A new study addressing this question led by Björn Davidsson of the Jet Propulsion Laboratory, California Institute of Technology in Pasadena (USA), has been published in Astronomy & Astrophysics. If comets are primordial, then they could help reveal the properties of the solar nebula from which the Sun, planets and small bodies condensed 4.6 billion years ago, and the processes that transformed our planetary system into the architecture we see today. The alternative hypothesis is that they are younger fragments resulting from collisions between older ‘parent’ bodies such as icy trans-Neptunian objects (TNOs). They would then provide insight into the interior of such larger bodies, the collisions that disrupted them, and the process of building new bodies from the remains of older ones. “Either way, comets have been witness to important Solar System evolution events, and this is why we have made these detailed measurements with Rosetta – along with observations of other comets – to find out which scenario is more likely,” says Matt Taylor, ESA’s Rosetta project scientist. During its two-year sojourn at Comet 67P/Churyumov-Gerasimenko, Rosetta has revealed a picture of the comet as a low-density, high-porosity, double-lobed body with extensive layering, suggesting that the lobes accumulated material over time before they merged. The unusually high porosity of the interior of the nucleus provides the first indication that this growth cannot have been via violent collisions, as these would have compacted the fragile material. Structures and features on different size scales observed by Rosetta’s cameras provide further information on how this growth may have taken place. Earlier work showed that the head and body were originally separate objects, but the collision that merged them must have been at low speed in order not to destroy both of them. The fact that both parts have similar layering also tells us that they must have undergone similar evolutionary histories and that survival rates against catastrophic collision must have been high for a significant period of time. Merging events may also have happened on smaller scales. For example, three spherical ‘caps’ have been identified in the Bastet region on the small comet lobe, and suggestions are that they are remnants of smaller cometesimals that are still partially preserved today. At even smaller scales of just a few metres across, there are the so-called ‘goosebumps’ and ‘clod’ features, rough textures observed in numerous pits and exposed cliff walls in various locations on the comet. While it is possible that this morphology might arise from fracturing alone, it is actually thought to represent an intrinsic ‘lumpiness’ of the comet’s constituents. That is, these ‘goosebumps’ could be showing the typical size of the smallest cometesimals that accumulated and merged to build up the comet, made visible again today through erosion due to sunlight. According to theory, the speeds at which cometesimals collide and merge change during the growth process, with a peak when the lumps have sizes of a few metres. For this reason, metre-sized structures are expected to be the most compact and resilient, and it is particularly interesting that the comet material appears lumpy on that particular size scale. 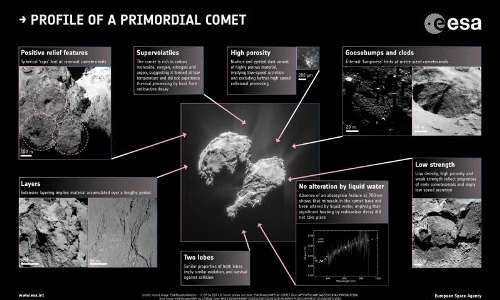 Further lines of evidence include spectral analysis of the comet’s composition showing that the surface has experienced little or no in situ alteration by liquid water, and analysis of the gases ejected from sublimating ices buried deeper within the surface, which finds the comet to be rich in supervolatiles such as carbon monoxide, oxygen, nitrogen and argon. These observations imply that comets formed in extremely cold conditions and did not experience significant thermal processing during most of their lifetimes. Instead, to explain the low temperatures, survival of certain ices and retention of supervolatiles, they must have accumulated slowly over a significant time period. “While larger TNOs in the outer reaches of the Solar System appear to have been heated by short-lived radioactive substances, comets don’t seem to show similar signs of thermal processing. We had to resolve this paradox by taking a detailed look at the time line of our current Solar System models, and consider new ideas,” says Björn. Björn and colleagues propose that the larger members of the TNO population formed rapidly within the first one million years of the solar nebula, aided by turbulent gas streams that rapidly accelerated their growth to sizes of up to 400 km. Around three million years into the Solar System’s history, gas had disappeared from the solar nebula, only leaving solid material behind. Then, over a much longer period of around 400 million years, the already massive TNOs slowly accreted further material and underwent compaction into layers, their ices melting and refreezing, for example. Some TNOs even grew into Pluto or Triton-sized objects. Comets took a different path. After the rapid initial growth phase of the TNOs, leftover grains and ‘pebbles’ of icy material in the cold, outer parts of the solar nebula started to come together at low velocity, yielding comets roughly 5 km in size by the time gas has disappeared from the solar nebula. The low speeds at which the material accumulated led to objects with fragile nuclei with high porosity and low density. This slow growth also allowed comets to preserve some of the oldest, volatile-rich material from the solar nebula, since they were able to release the energy generated by radioactive decay inside them without heating up too much. The larger TNOs played a further role in the evolution of comets. By ‘stirring’ the cometary orbits, additional material was accreted at somewhat higher speed over the next 25 million years, forming the outer layers of comets. The stirring also made it possible for the few kilometre-sized objects in size to bump gently into each other, leading to the bi-lobed nature of some observed comets. 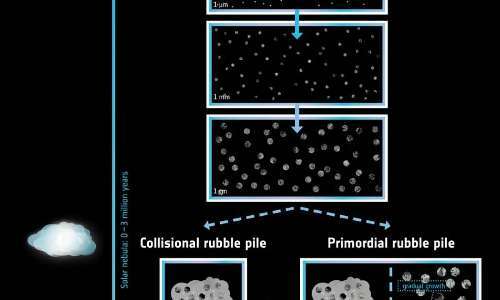 “Comets do not appear to display the characteristics expected for collisional rubble piles, which result from the smash-up of large objects like TNOs. Rather, we think they grew gently in the shadow of the TNOs, surviving essentially undamaged for 4.6 billion years,” concludes Björn. 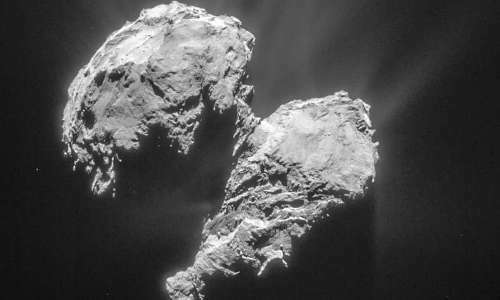 “Comets really are the treasure-troves of the Solar System,” adds Matt.